Four years after Obamacare became law, the number of Americans without health insurance fell precipitously in 2014. Last year, the percentage of Americans without insurance for the entire year fell to 10.4 percent, from 13.3 percent in 2013, according to new figures from the U.S. Census. The number of people without insurance fell from 41.8 million to 33 million. In addition to changes in federal law, the increase in health insurance coverage reflects an improving economy and a falling unemployment rate. Today’s uninsured rate is about 40 percent lower than it was in 2008, prior to the recession or the passage of the Affordable Care Act. 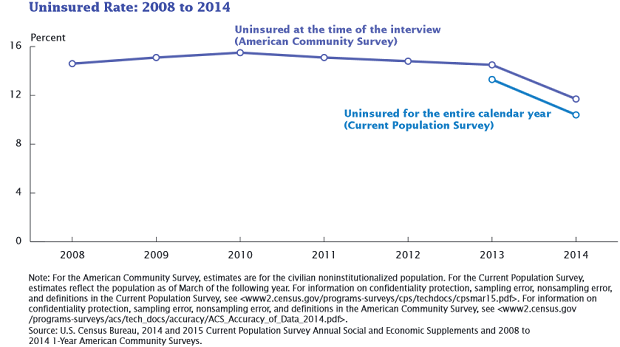 The Census report did not delve into the quality of health insurance or the cost to consumers, which has continued to increase since the passage of Obamacare but at a slower pace. More than half of Americans (55.4 percent) receive insurance through their employers, followed by Medicaid (19.5 percent), and Medicare (16 percent). Just under 15 percent of Americans buy their coverage via the public exchanges or directly from insurers. The largest growth in insurance coverage came from people purchasing their own insurance or using Medicaid. A large majority of the newly insured is satisfied with their coverage, according to a June report by the Commonwealth Fund. Nearly seven in 10 said they have used it to get health care, and of those more than 60 percent said they would not have previously been able to afford or obtain health care. Every state saw a drop in its percentage of uninsured residents, with the greatest declines taking place in Kentucky, Nevada and West Virginia.